Viura is a synonym used in the Spanish DO of Rioja for Macabeo, which is the most popular grape of northen Spain. High in production, the Macabeo adapts well to hot and dry regions. It also buds late which makes it less likely to be harmed by frost. Together with the varietals Parellada and Xarel-lo it is used in the production of the sparkling Spanish wine Cava. Both still and sparkling wines from the Macabeo are dry, medium in acidity, and have notes of delicate wildflowers and bitter almonds. Macabeo is best consumed young. Besides Cava the best examples of Macabeo come from Rioja, where it is known as Viura, and now makes up 90% of the still white wine production in that area. It can also be found in large quantities in southern France, particularly in the Languedoc area where it is usually blended with Grenache Blanc. Cune (the initials C.V.N.E. are short for Compania Vinicola del Norte de Espana, but in common practice everyone says “coo-nay”) is a well known winery in the Rioja region that works in a very traditional style.Cune Monopole is a dry, crisp white wine made from the local Viura grape. It is pale green/gold in color with aromas and flavors of grapefruit, wild herbs and hints of fennel and mandarin. This unoaked white Rioja is lean and lightly mineral in character. It is very refreshing and pairs well with marinated vegetables and fresh seafood. For the price that it commands at the SAQ, it is a real and obscene steal. On today’s post, I will discuss 2 Galician dishes that can be matched with one of the greatest Spanish grapes, Albarino. One of the most beautiful aspects of wine drinking is that you can match the wines with the regional foods where the wine come from. Any empanada recipe can be prepared in the shape of a pie, and might be called an “empanada gallega”, but the Spanish version has certain unique characteristics. Empanadas are in, Spain, Portugal, the Caribbean, Latin America, and the Philippines,a type of stuffed pastry.The name comes from the Spanish verb empanar, meaning to wrap or coat in bread. The dough of a Galician empanada is slightly different than typical Latin American-style empanada one, as it is made with olive oil and yeast. The Spanish traditional filling is a delicious mix of onions, bell peppers, tomatoes, tuna, and might include hardboiled eggs, and seasoned with smoky pimenton paprika. The empanada is often baked in a paella pan, thought you can also do it in a pizza pan. Pulpo a la gallega -Galician style octopus- is a century old recipe, because octopus has been consumed in this autonomous region for longer than we can count. Octopus was one of the few types of seafood that was transported from the coasts to the interior towns and in fact it was far more appreciated in the interior than near the sea. When America was discovered many products appeared in the Spanish gastronomy, including a spice obtained from some crushed red chiles , in Spanish they call it pimentón, in English: paprika. Not only does paprika give a tempting reddish tinge, but it was also great for preserving food in those time before frozen products and easy land transportation were available. But it wasn’t until a few years later that pulpo a la gallega became and actual dish. Some 125 years ago, when muleteers went to cattle fairs, they bought large amounts of octopus and then they’d prepare it with olive oil and paprika. Quite simple. The name in galician for pulpo a la gallega is “pulpo a feira” (fair style octopus) for a very simple reason. During the cattle fairs the farmers would buy or sell cattle, sell their farm products, etc, and buy groceries such as salt, sugar and other products they didn’t have daily access to. The trip to the town where the fair took place took a long time and most people would stay for lunch or dinner. Those who stayed near the fair venue could eat octopus (as we’ve mentioned before, it was a very typical dish in fairs). 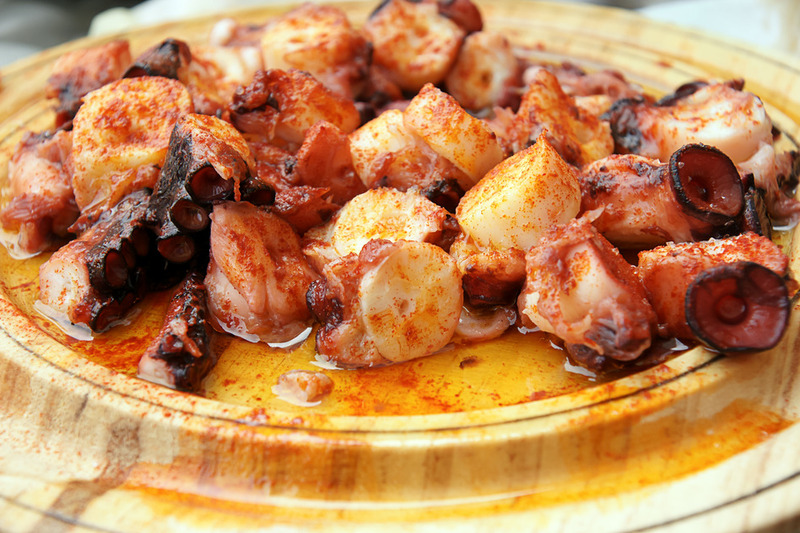 The “pulpeiras” (specialized in octopus) would cook the animal in copper cauldrons and serve it in wooden plates. It is said that the copper pot gives it an incomparable taste that it’s impossible to obtain with any other material. Viña Real has been producing wine since the nineteenth century and over the years They have consistently brought fresh ideas and techniques to the Rioja region. Today they can be found in Rioja Alavesa, a sub-region that were pioneers in barrel-ageing, and indeed Viña Real themselves were one of the first to make crianza wines. Their first wine was sold way back in 1920 from vines near the Camino Real (or ‘royal road’, an historic Spanish highway) which is where their name originated. They have retained this name, although they are now under the much larger umbrella of producers run by the famous CVNE organisation. Despite their many years of experience, choosing when to harvest is still a tricky operation as they only want to pick grapes at their optimum potential. When harvesting does get underway, it is done by hand, and the grapes undergo a further selection on automatic ‘hoppers’ at the winery. Vina Real Gran Reserva Rioja 2008. SAQ Code: 12497501. Price: $35.00. Aromas of blackcurrant with hints of coffe and dark chocolate and spices such as cinnamon. On the mouth, fruity, reminding me of sour cherries and strawberries. Elegant and structured with additional Rioja flavors of cedar and pipe tobacco. Lovely finale bringing to mind mint and confit red and blackcurrant. Drink now or cellar for the next 7-10 years. Viña Real is represented in Quebec by LBV International.